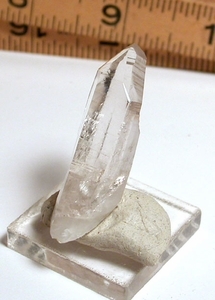 24 FACED natural Arkansas smoky quartz crystal, optically clear is miniature sized at 1/2x 1-3/4" from tapering termination to white regrown [self-healed] base, making it a prime candidate for your rarities collection and/or an outstanding pendant. 24 termination and prism FACES! Record keepers. Perfect long shallow growth crater. ONE fleabite. Excellent pale smoke coloring and a slightly rainbow foil near the base. Garland County. Rare, rare, rare.